We get a lot of press releases from companies big and small touting their green initiatives. I usually dismiss the ones from major corporations like Disney and Barbie as greenwashing, but I still pass them on to our writers. After much prodding and persuading from my online friends, I usually take up the issue myself, as I just can’t help myself. Disney….it’s your turn. 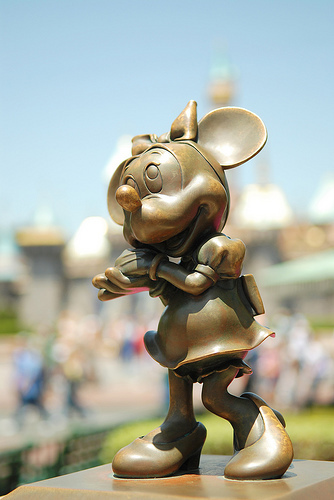 Disney has just issued the company’s first ever comprehensive corporate responsibility (CR) report. For a company that was founded in the 1920s and is the largest media and entertainment corporation in the world, this report is a long time overdue! For example, Disney’s two cruise ships in 2006 generated nearly 270,000 tons of “carbon-dioxide equivalents,” a measure of the various gases thought to contribute to climate change. The two ships, which sail out of Port Canaveral, accounted for 48 percent of Disney’s companywide emissions of 566,000 tons for the year. Yep, long record of environmental stewardship for sure! What about the six figures of energy consumed and garbage generated at Disney theme parks annually? Disney World just released its first Corporate Responsibility Report but leaves us wondering — “Why doesn’t it include a comprehensive section on the reduction of hazardous cleaning chemicals”? The report does make strong commitments towards reducing greenhouse gas emissions and water conservation, which we feel is extremely important for all businesses. 5. Show preference to independent third party certified products. Granted, Disney did purchase 8,500 acres of the Everglades’ headwaters to create The Nature Conservancy’s Disney Wilderness Preserve in 1993, but in the large scheme of things, does this mitigate the overconsumerism associated with Disney brands? Does it undo the abandoned cruise ship destination Treasure Island in the Abaco Islands, where the company left hazardous materials, electrical transformers, and fuel tanks, as well as introduced invasive alien species of plants and insects that threaten the natural flora and fauna of the island? I guess my greenwashing skepticism stems from the fact I cannot connect what I have seen at Disneyland itself and what I have read in the CR report. Yes, I succumbed to the pressure of parenting and the effort to provide my children with a “normal” childhood by visiting Disneyland once. I was shocked at the entry free of $69.00 and disgusted by the walk down Main Street stores selling overpriced Disney paraphenalia as you enter and exit the park. I tried a veggie burger that was disgusting, and I had to buy a $40 pair of sweatpants for my son when he had an accident (this was the cheapest pair of pants in the park!). As I watched little girls adorned in princess costumes, I felt like I was in Vegas. At Disneyland, it is all about money. There was nothing that spoke to me about environmental stewardship. Even the recycled toilet to tap water served at the park was not advertised (I wonder why?). During the coming year, we’ll begin the process of estimating the magnitude of the footprint resulting from product-related activities. In coming years, Disney intends to engage suppliers and licensees in a collaborative drive to reduce the environmental footprint of Disney merchandise. The sheer volume of products and intermediate parties, as well as the absence of firmly established protocols for determining the environmental impact of products in an unambiguous manner for all possible combinations of materials, are daunting issues associated with this goal. Make it happen, then maybe I can visit your park again without experiencing eco-guilt. Remove the overconsumerism associated with your brand; we don’t need a cup, t-shirt, stuffed animal, etc. for every character from every movie. Corporate responsibility goes beyond issuing a report and sending press releases to bloggers. Stop selling junk, stop using chemicals, only use recyclables, put a solar bank in the parking lot of all theme parks that could provide shelter for cars, create more green spaces in the parks, serve organic food, offer free park admission to people that ride mass transit, stop violating human rights in factories that produce your goods, etc. Disney, you have a long way to go before being green! This is really thought provoking Jennifer. I was at Disney having lunch last week and I was stunned at how eco friendly their offices were. I think they are moving toward sustainability, but it will be a long trek. Csr is more than green, it’s a whole host of material issues which a business the size and complexity of Disney must address. Disney has made progress in other areas.. though i tend to agree with the sentiment that Disney is moving slowly and in rather small steps. I would just like to point out that you failed to mention all the land that was bought in the 60’s and 70’s in florida. There are huge swaths of land that are never to be built on at Walt Disney World. I think the figure is something around 60% of the resort is wildlife preserve. Well at least they are taking steps in the right direction. They are a company not alone who did all the right things wrong. That’s why the world is in such a state. Most of us were ignorant many years ago.. there cerainly wasn’t the hype about the way were treating the world. Re- cleaning chemicals..well blame the big companies that mass produced them in the first place. Disney is not alone in the damage it has caused (and maybe still is) but if the companies selling hazardous cleaning chemicals were, let’s say..”closed down completely” then Disney or anyone else would have no option but to change suppliers and new business with non toxic chemicals would be the norm. Freddom of choice removed. That’s fine by me! It’s the source originally of anything ..if I had an allergy I wouldn’t just continue to treat it or live with it, I would remove the allergen. Toxic cleaning producers,slave labour sweat shops etc need to be completely removed form the whole of society. It will be extremely hard for Disney to make a major change, but it is good that they are trying. An analogy I could make is that of a cigarette company deciding they will become an advocate for good health – while remaining a cigarette company. Disney is in almost the same situation as far as environmental impact. Hi nice article. Found it while researching Disney’s enviro record for my own website. Just returned from a weeklong Disney trip organized by my daughter’s dance school. Happened to be there on Earth Day. I realize Disney’s goal is entertainment rather than education, but if greening at all – besides Jack’s giant beanstalk – (I need to read report and do more research)- they could surely take a lead in environmental education beginning with their parks. It wouldn’t take much (which is about all the effort they put in to their Magic Kingdom earth day tribute.) A few hours set aside for Jimminy Cricket photo-ops, and a kiosk that could have been more effective had it been designed by a bunch of school kids rather than Disney’s imagineers. Disney parks really could be leader and great educators for our kids. Wouldn’t that be great? I just got back from Disneyland this weekend. Your article is great and I plan to link to it in my post tomorrow. How can I reconcile the utter joy I feel at Disneyland with not only the environmental impact but also the homogenization of culture and the promotion of consumerism? There was a sale at one of the Disney Stores for annual pass holders that started at 7am. I was told that afterwards, the store was practically totaled and it took the employees several hours to clean up, restock, and get ready for the onslaught of regular shoppers. And yes, I found out about this because I saw the lines from my balcony in the Grand Californian Hotel, where my boss had paid for rooms for me and a co-worker, and then talked to a Disney Store employee while I was making my own purchase: a $52 hoodie (I actually paid $42 with coupon from a food receipt) made in Asia that I bought because I was freezing and hadn’t come prepared for cold weather in Southern California. On the other hand, the Twilight Zone Tower of Terror, California Screamin’, Splash Mountain, Thunder Mountain Railroad, Haunted Mansion, and anything else that’s scary — especially with one or more big drops — leave me absolutely giddy with happiness. How can I reconcile what I know with how I feel? Very informative. I love the picture BTW. Came across this while doing research on Disney’s green initiatives. One thing that is helpful to understand is that different parts of Disney have different missions and goals. The Magic Kingdom and Disneyland are specifically for escapism. These parks make it their mission to to transport people away from their cares and worries and to simply entertain. At Disney World, they have other parks that educate: Epcot and Animal Kingdom both aim to educate the visitors and teach them about many things, including conservation and environmental issues. 10-15 years ago, when I was lucky enough to visit Disney regularly and go behind the scenes, I noted that they were doing “green” things. For example, this was the first hotel I ever saw that wasn’t washing towels and sheets every day, unless you requested it. There were signs explaining change and the environmental goals behind them. These were small, but real changes. I had the opportunity to visit their laundry facilities where they explained that through employee input they were able to both reduce costs and the use of water and energy. By doing the laundry on the premises they were able to create more jobs, reduce the need to transport their laundry very far and control quality. Honestly, while some of us would think it is wonderful that they are using recycled toilet to tap water, that would frankly gross out the majority of their target audience. With the type of people that visit Disney, you need to start with baby steps. I notice that they are starting with baby steps by having Green information on their tv shows and on ABC. I’m curious how things have changed there and I’m looking forward to finding more current information… If you have more recent posts with current information, I’d be interested to see them!